To give a quick summary of where I’m at with this project, I’ve got my breadboard circuit attached to the end of a rotating arm and it’s streaming data back to my PC. 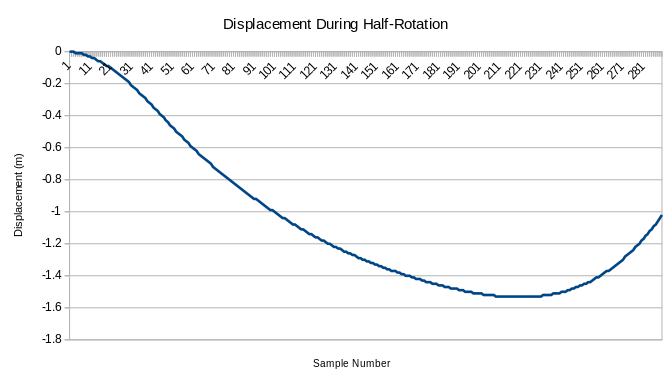 I’ve performed some basic analysis on this data and have double integrated the z-axis acceleration to get displacement and this displacement value roughly matches the length of the rotating arm. 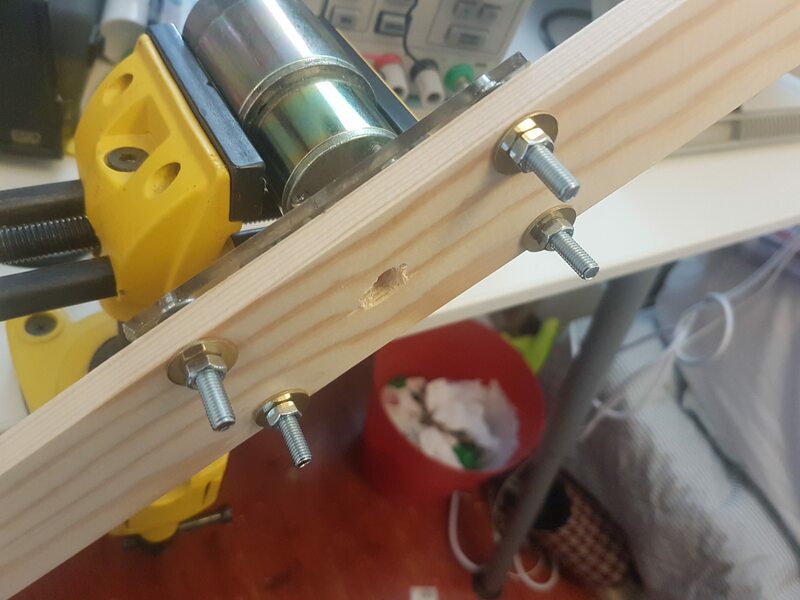 It’s useful to first see how the breadboard moves as the rotating arm rotates. It doesn’t stay perfectly horizontal which is actually a good thing as this means it is slightly more accurate a representation of a real life data buoy. 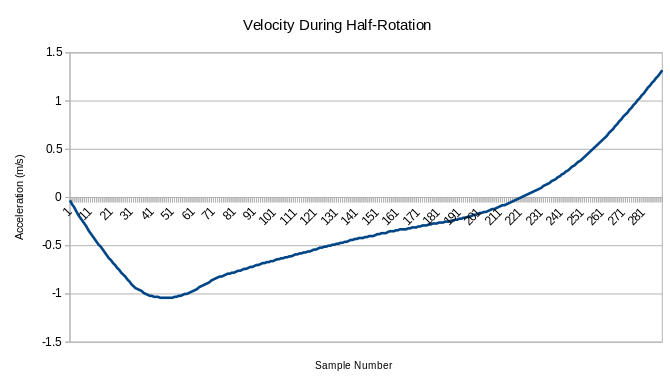 This graph contains acceleration data from about four and a half rotations. The good news is you an see a clear periodic element to the data which does roughly coincide with how long the rotations take (for this set of data each full rotation was around 4 seconds). It’s a bit puzzling the way the acceleration dips a bit before increasing and then dropping down to around -4m/s^2. One possible explanation is this occurs when the IMU is near the top of the rotation, the mount does not stay completely horizontal as there is some friction with the rotating arm. This causes the rotating mount to rather quickly flick from one position to another when near the top of a rotation. This flicking action may momentary cancel out the z-acceleration before the imu starts to properly descend once again. This action can be seen in the video above. Another contributing factor may be that the rotating arm is weighted in an unbalanced way. 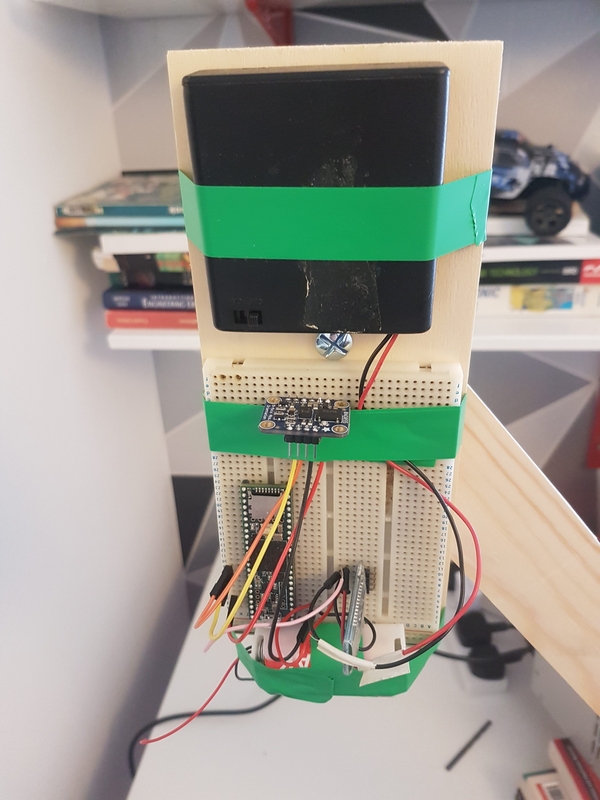 If the counterweight is a bit heavier than the breadboard it would have a slight catapult effect when the IMU is near the top part of the rotation. 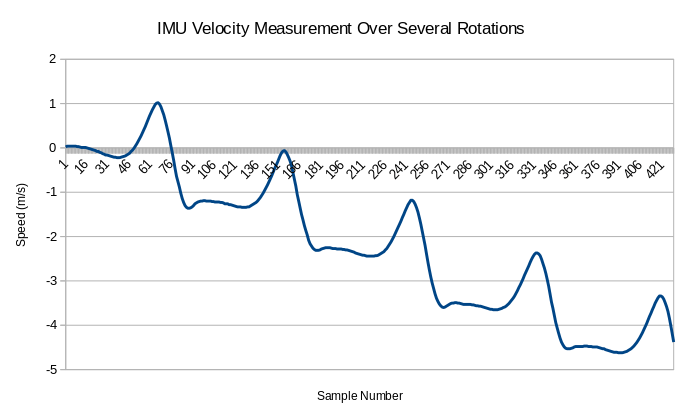 In the graph above, the minima where the acceleration drops to around -4m/s^2 represents the IMU at the lowest part of the rotation (6 o clock on a clock dial). So if we integrate from one minima to a neighboring one this will give us the instantaneous velocity for each point in one rotation. For my displacement data experiment, I took the acceleration from one half rotation which was from the 6 o clock position to the 12 o clock position. In reality I was a bit off so it’s a bit more than one half but it doesn’t really matter as you will see in the graphs below. If we integrate this velocity once more, displacement can be obtained. This initial test has shown quite encouraging results. The length of the rotating arm is 1.5 meters and the IMU is mounted right at the end of the arm. This means going from the 6 o clock position to the 12 o clock position, the IMU will travel through a vertical distance of 1.5 meters which you can see is roughly the maximum displacement on the displacement graph. From the graph above you can see the issue related to absolute 3d position tracking with IMU sensors. The fact that to get velocity you have to integrate an acceleration measurement means that even tiny errors will accumulate. Then performing another integration of the velocity to get displacement means that any errors in the acceleration measurement are integrated twice and so the error accumulates in an exponential fashion. As a result, the general consensus is that IMU devices are not suitable for absolute 3d position tracking. The reason why wave sensors can get away with this is they use a statistical measurement approach. 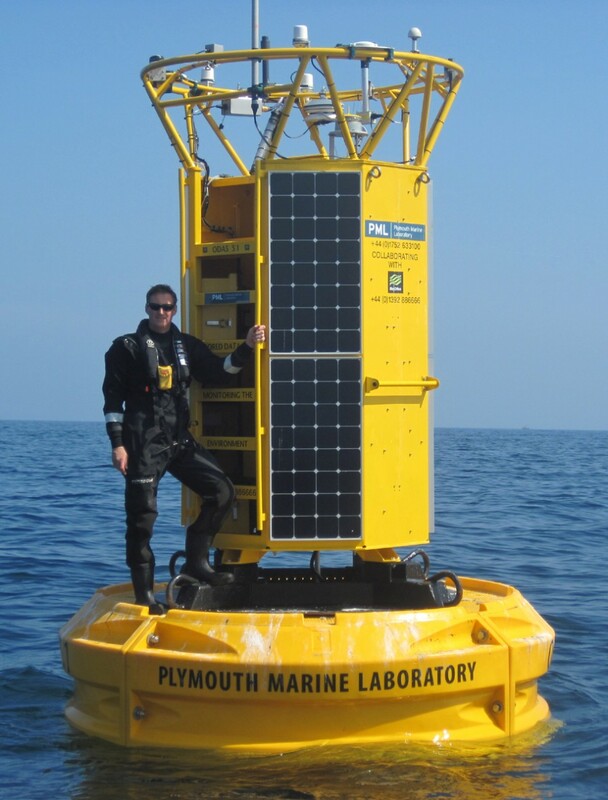 Measuring the height of a single wave may have a relatively large error margin but measuring the heights of say 1000 waves and reporting the significant or average wave height has been achieved by many commercial wave sensors. One step needed is to periodically reset the integration counter. 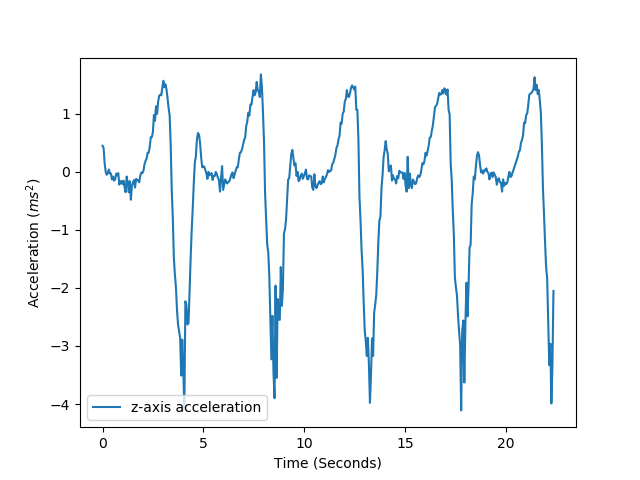 In the first graph in this post of z-axis acceleration, the minima stand out on the graph as easy spots to reset the integration counter. This means that any error that accumulates would only have around 4 seconds to do so. It’s early days in terms of algorithm development. 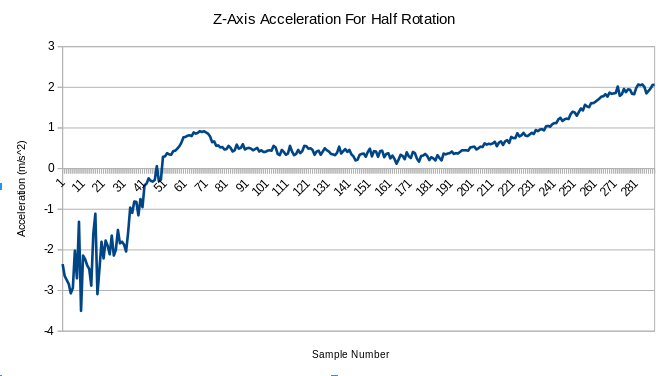 This post is a quick record of some analysis on the first data set of linear acceleration from the rotating arm. For the next week I will try to develop the algorithms further, Hopefully to the point where the starting point is a set of linear acceleration data and a program that can just spit out a value for maximum vertical displacement. Wave direction is another important parameter and the next few days will be spent thinking about how to approach that problem. Once these basics are taken care off, I can start to introduce statistical analysis and frequency domain representations of the data. The small blue pcb with the four mounting holes is the BNO55 breakout board from adafruit. The vertical standing pcb is a serial bluetooth adapter and the green pcb on the far right is a teensy 3.6. The whole thing is powered by 4AAA batteries because I’m intending to put this on the end of a rotating stick and don’t want power cables getting in the way. 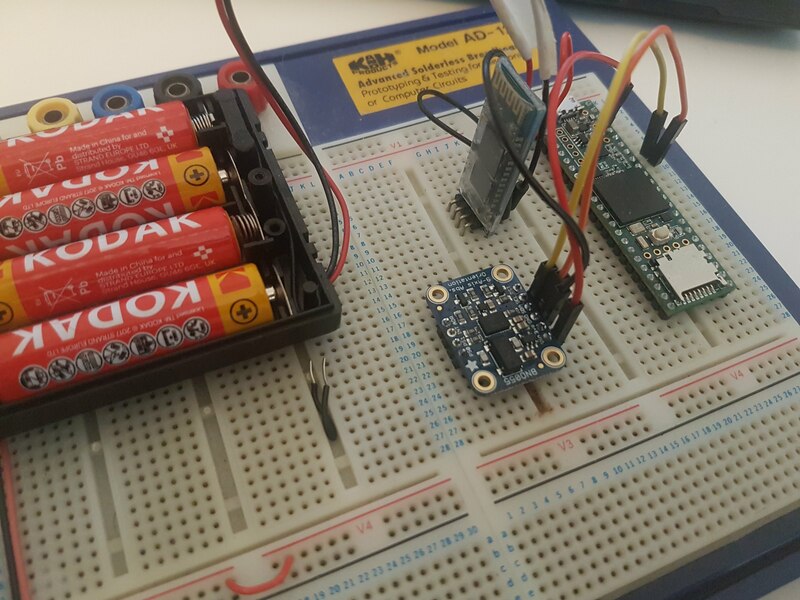 The Teensy communicates with the BNO55 via I2C and also can send serial data via one of it’s UART ports which is connected to the bluetooth serial link. As you can see from the video, the speed of the arm is not constant as it rotates around. 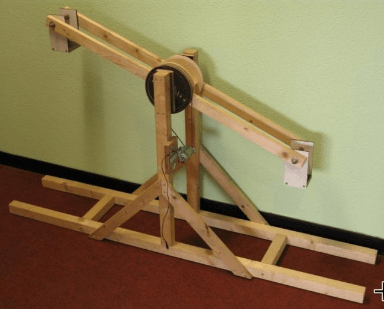 When the arm is vertical or approaching vertical the law of the lever makes things a bit easier on the motor so it is able to accelerate a bit, when the arm is horizontal that is the hardest part of the cycle for the motor and so the arm slows down. This isn’t an issue and it probably is a closer analogue to a data buoy on a wave than if the acceleration was kept constant all the way around. The end goal is to have the breadboard circuit with the batteries, bluetooth adapter, teensy and BNO55 attached to the rotating arm. The one detail that will require extra attention is that the electronics need to stay more or less horizontal as the arm rotates. 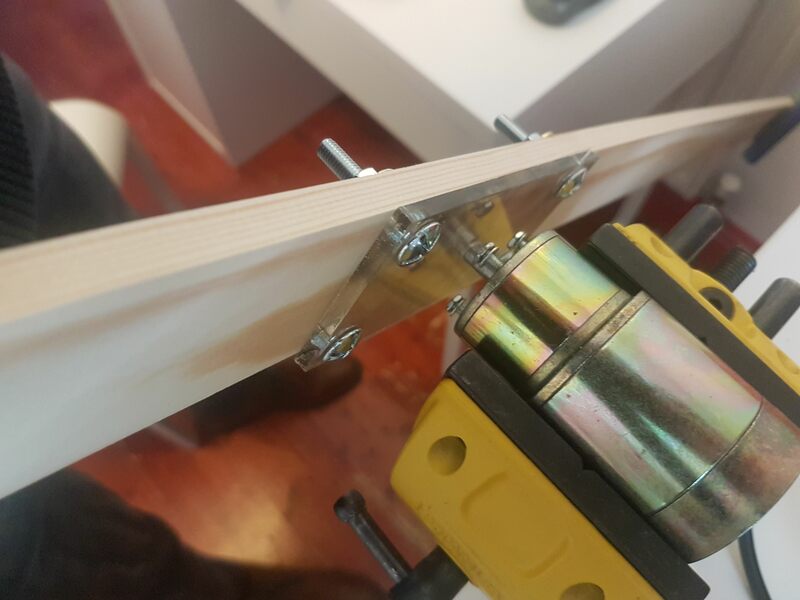 This will require some kind of mount that can rotate freely and has a bit of weight towards the bottom so as the arm rotates the mount stays horizontal. Having the electronics rotate with the arm would make the IMU calculations way more difficult. I’m not saying it’s impossible, it would just add a layer of complication that is totally unnecessary for the current application. Once the electronics is mounted to the arm I can start thinking about how to approach the software for the project. My thoughts at the moment are that it might be easier to get the raw IMU data for a couple of rotations, store that in a CSV file on my computer and try to develop some algorithms using that data. Once I get something working on the PC I can then go back and try to run it on the microcontroller. I think this approach will be fastest but I’ll give it more thought over the next few days. 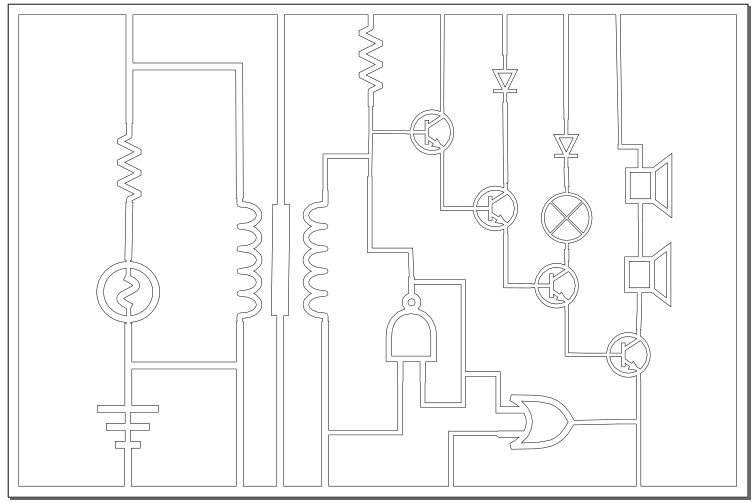 This circuit diagram was designed in Inkscape with all of the electrical symbols taken from the WikiMedia commons electrical symbol library. It’s got transistors, voltage sources, LEDs, resistors etc all in SVG format. 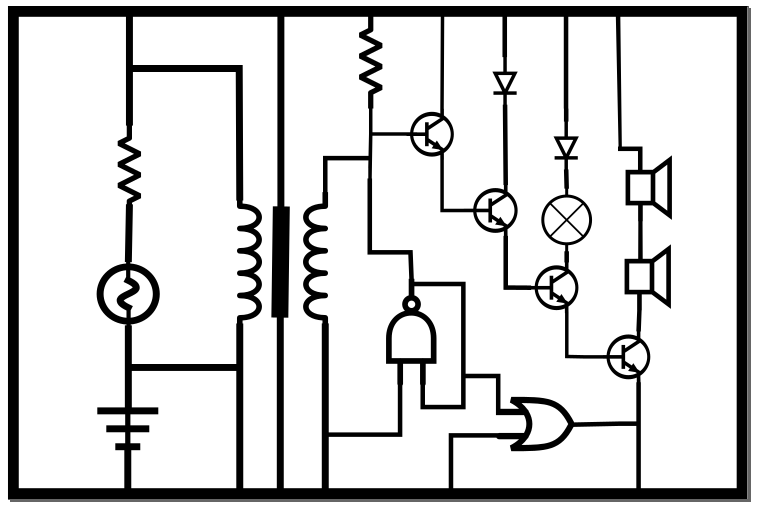 There are a few steps in Inkscape to convert a circuit diagram to something that can be laser cut. Step 1: Convert everything to a path using the stroke to path option (found in path>stroke to path). Take a look at these pictures to get an idea of what this does. Take these two images, they both look the same in normal view mode, but viewing them in ‘outline’ mode is effectively what the laser cutter works off. This example is just a resistor taken from the wikimedia commons library and line attached to either end of the resistor. The lines are red just so you can differentiate them from the resistor. 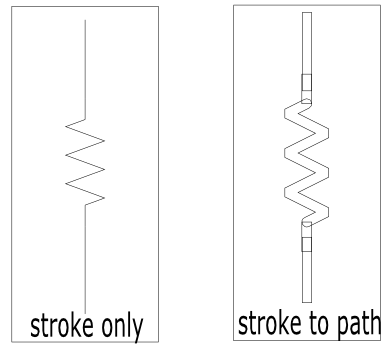 Notice in the stroke only image its a single line which is not what we want. We want to cut out the outline of the shape – the stroke to path option does this. That’s it! 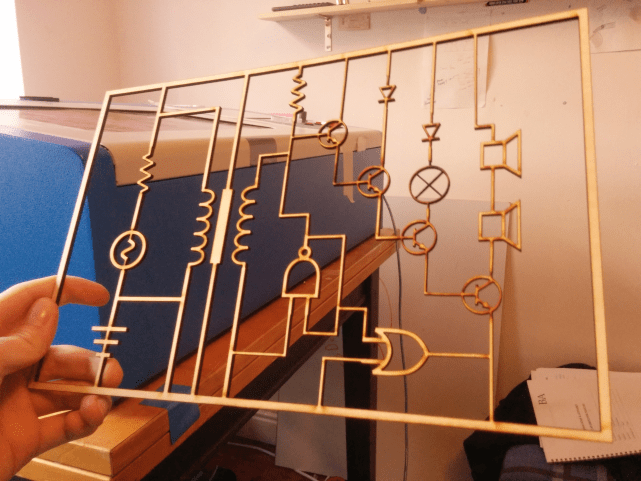 circuit diagram is now good to laser cut.